Around 180km, between the cities of Itacaré and Canavieiras, form the so called Cocoa Coast. Home to nature wonders, rivers flanked by cocoa farms, beaches of vast untouched coconut groves amid the Atlantic Forest and dense mangroves, the region enchants for its landscapes and the opulence of the golden years of the “black gold”. The architecture preserves the colonial houses of the 18th and 19th centuries, in streets paved with stones, churches and old mansions, important part of the national history that date back to the period when the production and exporting of cocoa were the primordial activity of the Brazilian economy. Scenery of movies, soap operas and novels – most of Jorge Amado’s work, translated in several countries, is set in Ilhéus, main city of this coast – , the region besides being part of history is the right destination for those looking for fun and close contact with nature. 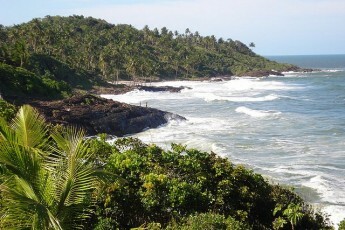 Canavieiras, Ilhéus, Itabuna, Itacaré, Santa Luzia, Una and Uruçuca offer a variety of options for tourists. The abundance of beaches includes from surfing and fishing spots to calm waters and true deserted paradises. Extreme waterfalls – like Cleandro’s, in Itacaré-, rivers and rapids are an invitation to practice adventure sports such as rafting, rappel and canoeing.